Microsoft Tested Windows Phone 8 on HTC HD7 and HTC Surround? A Windows Phone developer has tipped our friends over at WMPU with an interesting story. If the following stats are to be believed, it looks like Microsoft tested Windows Phone 8 on current Windows Phone devices. 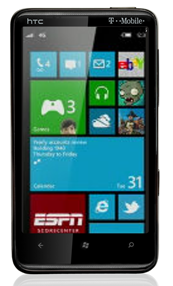 The stats above indicate that the HTC HD7 and HTC Surround were used in Windows Phone 8 testing. Does this mean that Windows Phone 8 is in fact very possible? It remains to be seen as this information could just be Microsoft actually trying the OS and testing it to see if it would work. So this proves (if true) that Microsoft did in fact have Windows Phone 8 running on current handsets. It could’ve bombed however and that is why we will get Windows Phone 7.8 this fall. Written by: Hyde13 on June 29, 2012.
is htc surround 7 is upgrade to windows 8??? i wann upgrade my htc hd 7 wp 7.5 to wp 8.0 how it is possible or not? The HTC HD7 has been updated to 7.10 but as far as my findings go, will not be seeing windows 8. unfortunately. how can i upgrade my htc surround to wp 7.8 ?